If you are looking for the Best Homemade Oven Beef Jerky Recipe, look no further! 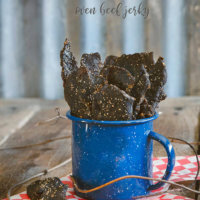 My husband has mastered the art of beef jerky and this recipe is full of flavor and has the perfect chewable jerky texture. Beef jerky. You either love it or hate it. I confess, I am not a fan of the stuff. It’s dry, tastes terrible and makes your jaw ache from chewing it. I was not very thrilled when my husband first told me he was going to make homemade beef jerky in our oven. My kids, on the other hand, love beef jerky. We would buy it as a nice protein rich snack for them for school, hikes or camping trips. My husband especially liked to buy homemade beef jerky from the small town shops we would visit on our road trips. After two years of making homemade oven beef jerky, my husband has mastered the recipe and technique to make beef jerky at home, in the oven and without a dehydrator. 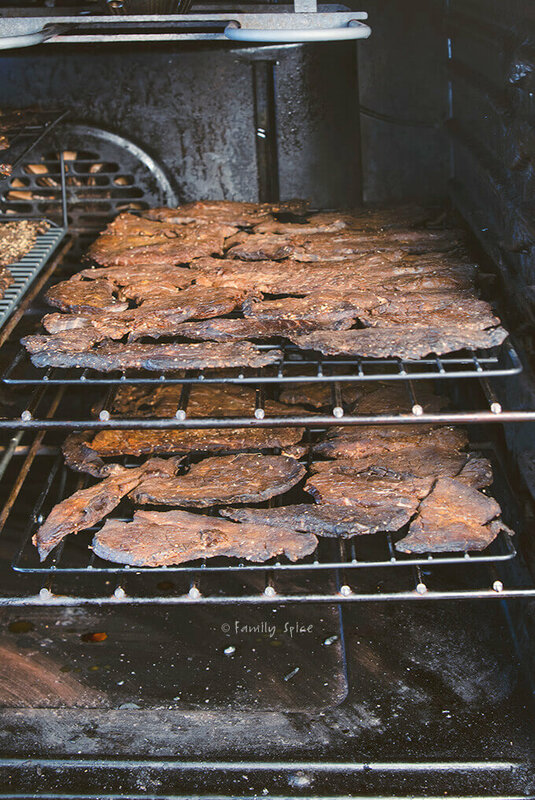 My kids, my nephews, our whole extended family (including a 15 month old baby boy) inhale this recipe for oven beef jerky every time a batch gets made. And now I’m ready to share this fabulous recipe with all of you. 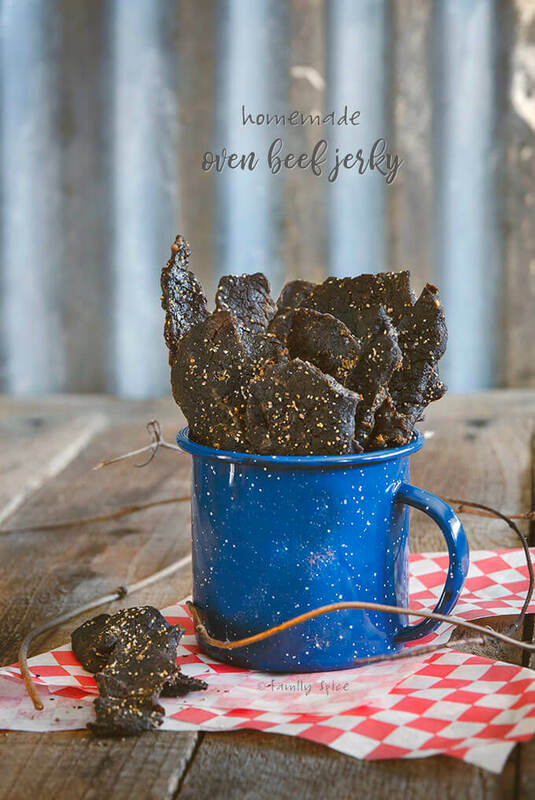 But a word of caution: once you make this homemade oven beef jerky, you will not be able to go back to the store bought stuff again! Jerky is a way to preserve meat by drying it completely to prevent it from spoiling. This was a great way to make meat last for months and months. An ancient Incan tribe called the Quechua, would slice thin cuts of meat, pound it down and salt it. Then then the meat would be dried in the sun and smoked. 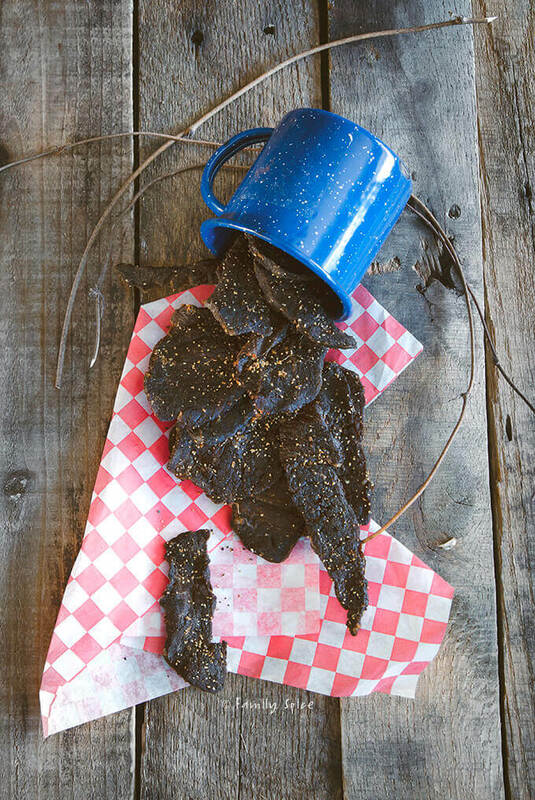 They called this meat “ch’arki” and it has since evolved into what we call it today, jerky. This method of preserving meat can be used for any meat variety, from llama to elk to deer and even beef. Today you can find all kinds of varieties of jerky in all kinds of flavors. But the basic technique is the same. Today we don’t sun dry our jerky. 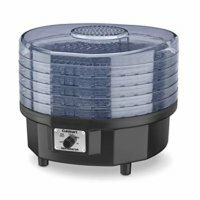 You can use a dehydrator or smoker to slowly dry out your meat. 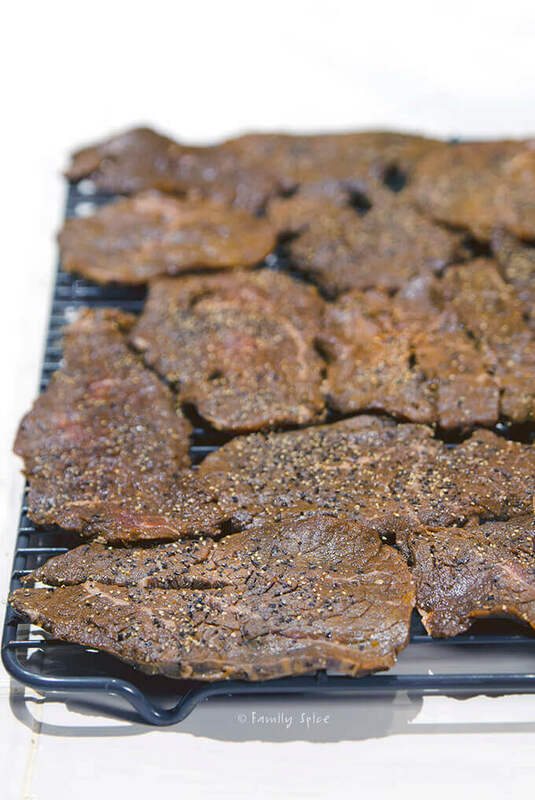 But the simplest way to make beef jerky at home, is to oven dry it. No fancy equipment is required. You want the temperature to be low, 150ºF-170ºF. And you can “cook” or oven dry the beef for several hours. 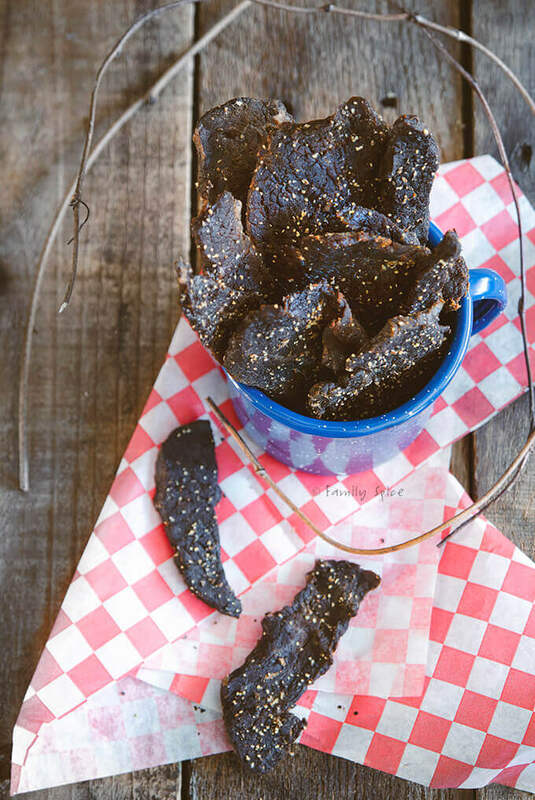 Although this sounds super simple, there are still a few tricks you need to follow to master your oven beef jerky. You can use a number of different cuts of meat to make oven beef jerky. We’ve tried them all, from London broil to sirloin and even flank steak. But we found the best texture and the most tender meat choice to be the eye of round. The beauty of the the eye of round is that it is meaty, cheaply priced, and incredibly lean. 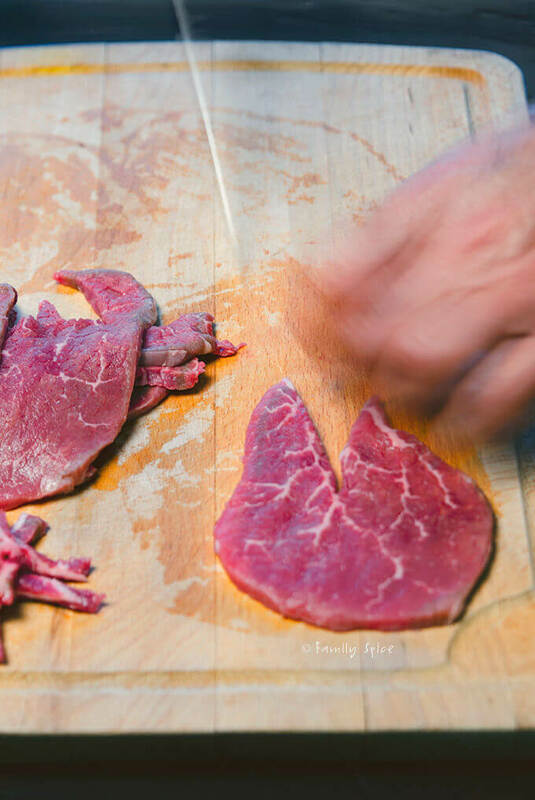 Whatever meat you use for your oven beef jerky, you do need to slice the beef across the grain about 1/8 to 1/4-inch thick. If you want a chewier jerky then slice the meat with the grain. 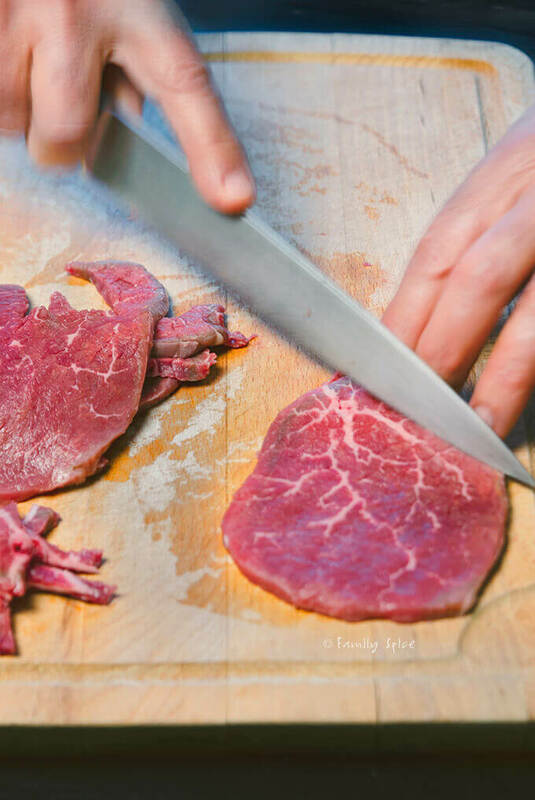 Many butchers will slice the meat thinly for you, but you can easily do it at home. My husband bought a meat slicer off of craigslist a few years ago, so he used that. A meat slicer is definitely not necessary. To cut meat into thin slices, you should freeze the meat until partially frozen, about 1 hour for my eye of round. 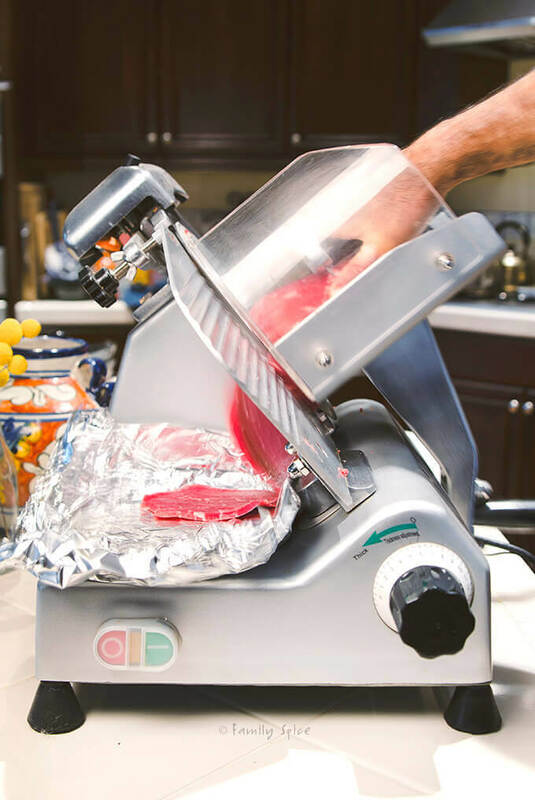 This keeps the meat firm during the slicing process, guaranteeing nice thin and even slices whether you use a sharp knife or a meat slicer. Now that the meat is cut up, you still need to remove any large visible deposits of fat. Even with the lean eye of round, veins of fat pop up and must be removed. Fat and moisture is the number one cause of beef jerky spoiling, so remove as much fat as you can. Our scraps of meat did not go to waste. Simon, our rescue mutt, is always on hand when dad is preparing beef jerky. He’s always a happy assistant when it comes to scrap meat removal! Once the beef is trimmed of fat, we are ready for the marinade. We have evolved from eating salted meat from the days of old. We need and love flavor to make the whole eating experience worth while! And just like my husband has experimented with different cuts of meat for oven beef jerky, he has also experimented with different marinades. The marinade I’m sharing with you now is the one that my family has voted to be their favorite. And best of all? There is no sugar added to this beef jerky marinade. Simply place your trimmed beef into a large resealable bag and pour the marinade over it. Once the bag is sealed, give the meat a good massaging to help mix in the marinade between all of the slices. Marinate for 24 hours, giving the meat another massage or two during the wait time. Dry the meat before you dry the meat! So now you have the meat sliced just right, the fat is all trimmed off and it has been marinating overnight. You’re almost ready to to slide it into the oven. BUT FIRST, you need to press out all of the excess liquid your meat slices have soaked in. My husband’s technique for doing this is to lay down paper towels on a large cutting board and add a layer of meat over it. Place more paper towels over the meat and layer more meat over the paper towels. Continue doing this until everything is covered in paper towels. I’ve seen some wild setups of oven drying beef jerky. But the best way of evenly drying out the meat in the oven is to use wire baking racks. We have several types of wire racks, too, so we are able to place them on top of each other allowing enough room for air to flow between the racks. You could place the meat directly on top of your oven racks, but you do have to make sure those are already clean. Plus by using wire baking racks, you can easily rotate the racks during the drying process in case your oven has any hot spots. After you place the meat slices on the wire baking racks, pat them dry again with paper towels. Line the bottom of your oven with foil to make clean up MUCH easier. This is a step my husband always seems to forget – grumble, grumble. 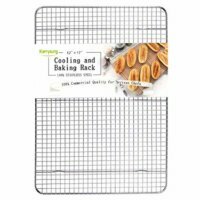 You can also place the wire baking racks directly in a large baking sheet. But I think the air circulates better through the meat by placing the wire racks directly in the oven. Set your oven temperature to 150ºF to 170ºF and prop the door open. Our oven temperature only goes down to 170ºF so we close the door with a dish towel lodged in to keep it propped open. You don’t want to cook the meat, but slowly dry it out. When is oven beef jerky done? Although I say to dry the meat in the oven for 2-4 hours, it is not a simple formula when making oven beef jerky. You know the beef jerky is done when it is no longer moist to the touch and does not bend without cracking. If the jerky breaks immediately when you try to bend it, then you over dried your jerky. We are always checking the status of the jerky during the drying process. Set the temperature for 170ºF for an hour, then turn the oven off for 30 minutes. Turn the temperature back back to 170ºF and dry for another hour, then again, 30 minutes with the oven turned off. We do this about 4 times until the jerky is completely done. 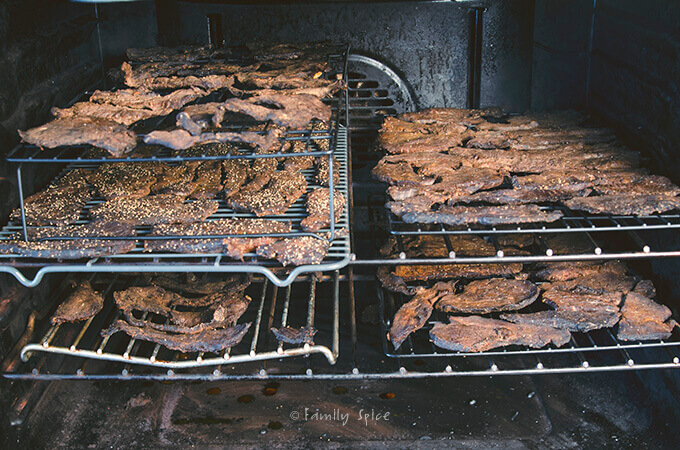 Remember, the total drying time depends on how large your jerky pieces are. Some of the smaller and thinner pieces dry first, so I remove them from oven before the larger pieces. If all of the pieces of meat are the same size, they should dry out at the same time. Typically homemade beef jerky should last 1-2 months. But it does depend on a few factors. The amount of fat and moisture in your beef jerky affects spoilage, so make sure your oven beef jerky is trimmed of all visible fat and is completely dry. Oxygen is also a factor in the shelf life of beef jerky. Store your cooled oven beef jerky in air tight containers. 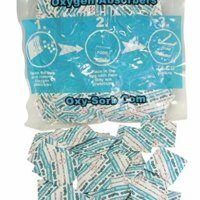 You can add food grade oxygen absorbers in the container with the beef jerky. This helps prevent bacteria growth. 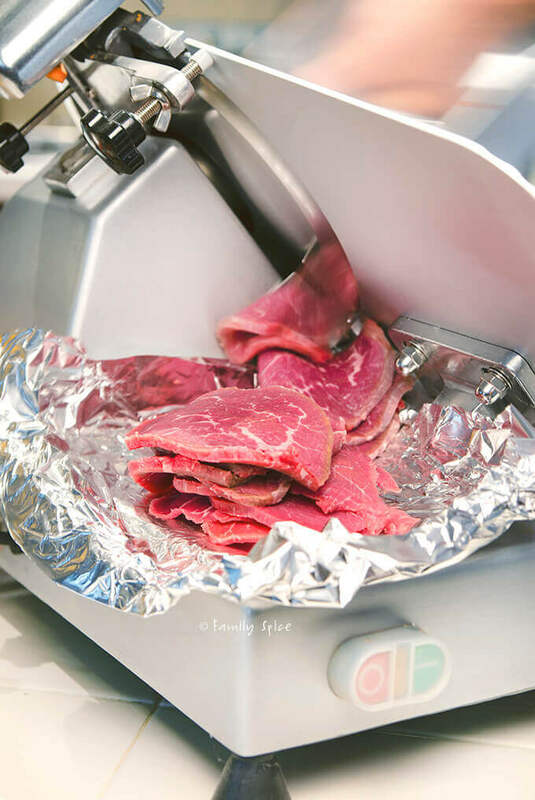 You can also use vacuum sealers to store your homemade oven beef jerky. We store our beef jerky in resealable bags with a paper towel in it inside our pantry. You know your beef jerky has gone bad as it has darkened in color, hardened and changed in smell. I’ve never tested the theory that homemade oven beef jerky will last for 2 months as my family finishes it up way beforehand! Beef jerky is fabulous source of protein and great a snack option for those on a low carb or keto diet. For my 4-year old nephew, it’s the one protein he will eat willingly and without a fight! My husband and boys take beef jerky on camping trips and hikes as they are a great way to keep their energy up, besides the usual trail mix. Beef jerky is also a popular protein choice for backpackers. Backpackers choose foods that are light in weight, first and foremost. And since you don’t want to lug a cooler of ice with you, carrying fresh meat is not an option. This is where meat jerky excels. My husband adds beef jerky to packages of store bought beef stroganoff while on backpacking trips. The Boy Scouts also add pieces of beef jerky to soup and ramen packages they cook up while on these trips. It’s a great way to add protein to fill you up while you are out and about in the great outdoors. Trim all exterior fat off the eye of round. Flash freeze the meat for 1 hour so it is frozen on the outside, but soft enough on the inside to slice with a knife. Using a meat slicer or sharp knife slice the beef against the grain into 1/8 to 1/4-inch thick strips. Remove any large deposits of visible fat you find in your slices. Place the beef slices into a large resealable bag. In a large bowl, whisk together marinade ingredients. Pour marinade into bag with the meat and seal closed. Massage and shake the meat so the marinade coats every strip. 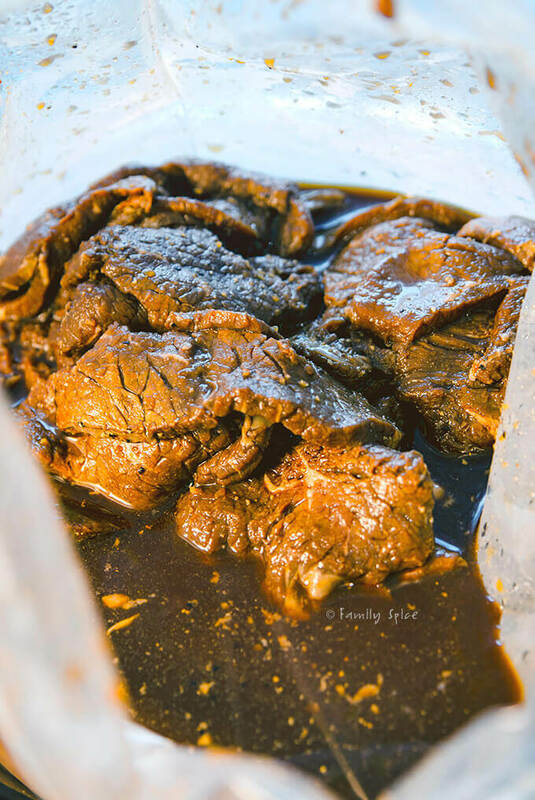 Place the bag in the refrigerator and marinate the beef for at least 6 hours, but up to 12 hours. The longer the beef marinates, the better flavor your beef jerky will have. Line a large cutting board or work surface with paper towels. Remove beef slices from marinade and place in one layer over the paper towels. Cover the meat with more paper towels and continue adding layers of meat and paper towels until all of the meat is removed from the marinade. Remove beef jerky from paper towels and place in a single layer without overlapping onto metal baking racks. You can use more than one. Line the bottom of your oven with aluminum foil and heat oven to 170ºF and place the racks in your oven. Prop your oven door closed with a kitchen towel. Do not close it completely. Bake beef jerky for 1 hour, then turn oven off for 30 minutes. 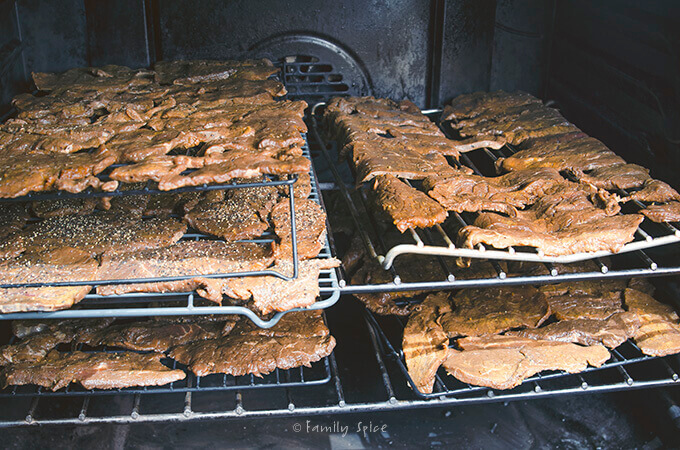 Bake again for 1 hour at 170ºF and continue this method of drying out the meat until beef jerky is dry to touch. Remove smaller pieces that are done and dry. When beef jerky is completely dry and cooled, store in an air tight container in a cool dark place. 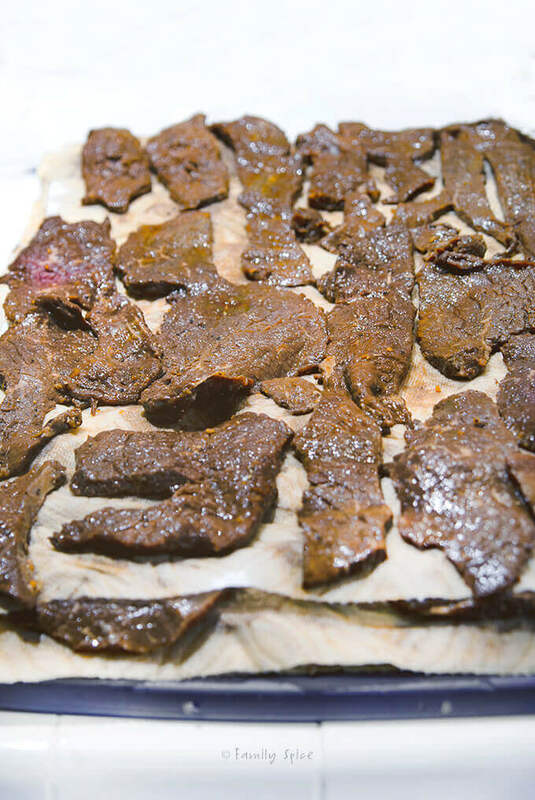 Homemade beef jerky can last for up to 2 months. If you like black pepper, sprinkle some ground black pepper over your beef strips before you place them in the oven to dry out. I’m not a big fan of beef jerky, but I know some people who consider it an essential food group. 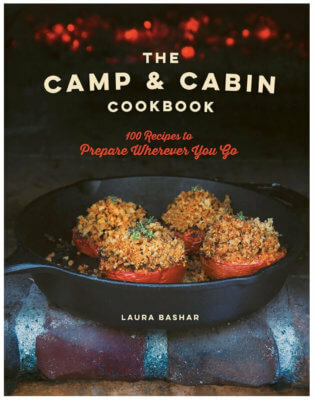 Fun recipe — even though I’ll never make it, I found it really interesting. Thanks! I’m not a fan of beef jerky either, but my husband and kids ADORE it. I’d rather they eat the homemade version so I’m happy they love this!